Not only was it a thoughtful and generous gift — it was delicious, with a grassy freshness pairing with a slightly tart complexity reminiscent of bufala mozzarella, a characteristic more often more evident in raw cheeses. For more than a month, I cherished the cheese — doling out small bites to worthy friends and family, tucking slices into my Mexican cuisine. And I mourned when it was gone. In addition to delighting me for that month, it made me rethink my beliefs on Mexican cheese. And on various subsequent visits to Mexico, I have sampled a wide variety of fresh and aged regional cheeses, all delicious. One of my favorites, which is widely available in markets north of the border, is queso cotija. It is, essentially, Mexico’s answer to parmesan — a salty, aged cheese that can be crumbled over tacos, enchiladas or chilaquiles, or melted as a toothsome addition to quesadillas or queso fundido. Even gringo applications would benefit from queso cotija — try crumbling some over a salad as a less-sheepy alternative to feta. I always know a food is going mainstream when it shows up at Trader Joe’s. (Or, in the case of Mexican foods, that it’s going gringo.) So I wasn’t totally surprised, after using it for years and singing its praises, to find queso cotija in the cheese aisle at TJ’s. All of this provides a nice lead up to talking about my new and current favorite taco — I’ve had them three days in a row for lunch. 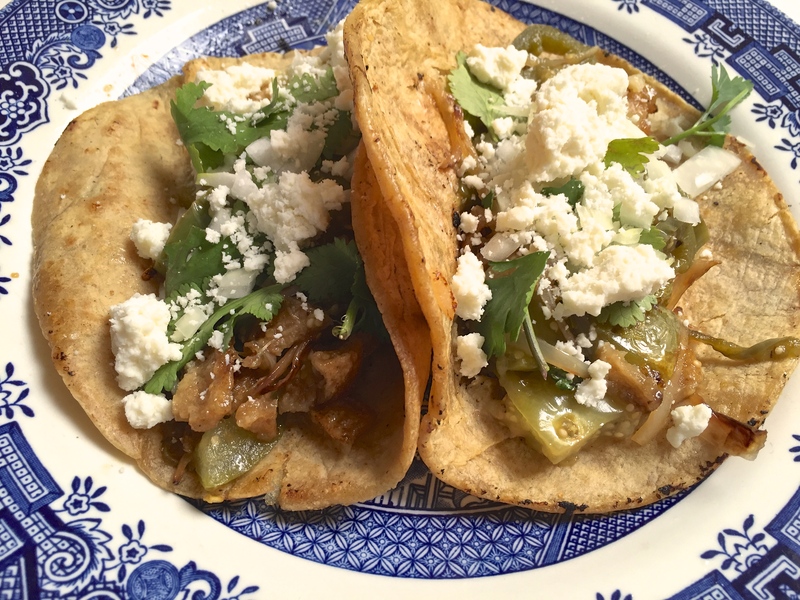 I can’t remember where I first saw or heard about them, but tacos de chicharrones combine tangy tomatillos, spicy jalapeños and sweet onion with the porky goodness of their namesake ingredient — chicharrones, whose trademark crunch is tamed into a chewy, toothsome confection. And, best of all, they are perhaps the best showcase for queso cotija I can think of. The tart, briny brightness of the cheese perfectly offsets all the above ingredients. Like the best dishes, each component stands out on its own, and yet complements the others to create a focused, unified whole. Mmmmm. Heat oil over medium heat in a large skillet. Add tomatillos, slivered onion and 1/4 cup cilantro. Saute for about 2 minutes, until onions and tomatillos begin to brown. Add 1/4 cup water and reduce heat to medium low. Continue cooking, pressing down on mixture with spatula or wooden spoon, until soft and thoroughly incorporated, about 5 minutes. Crumble up chicharrones with your hands and stir into tomatillo mixture. Push mixture to the side of the pan, add another teaspoon of oil if the pan seems dry, and cook the tortillas about 1 minute per side, until soft (you should be able to get 2 or 3 tortillas in the pan at a time). Remove pan from heat. Toss together remaining 1/4 cup cilantro and 1/4 cup chopped onion. Spoon the chicharrones mixture into the tortillas evenly. Top each with some onion and cilantro, and sprinkle with queso cotija. Serve with a cold Mexican beer or a margarita. That dies it! I’m coming down. sorry, I meant DOES it! If you plan a visit at the right time, you can see either Flynn and Willa in the school play, or one of Flynn’s baseball games! Wow, what a nice gift.